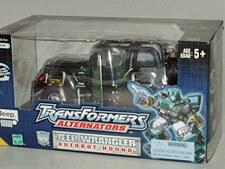 The highly anticipated and much lauded 3rd Hasbro Alternator is out and hitting stores near you. Though many people are complaining that the figure is very hard to come by, and not even released yet anywhere. I can safely say that Hound is out yet I'm sure that not every store will have him. I made my purchase at Wal-Mart, which I despise, but that is another matter. All I can say is that the toy is well worth the wait. Hound comes in the usual Alternator package, and transformed in his vehicle mode. The rendition of a Jeep Wrangler is top notch. What we have come to expect from this toy line series. 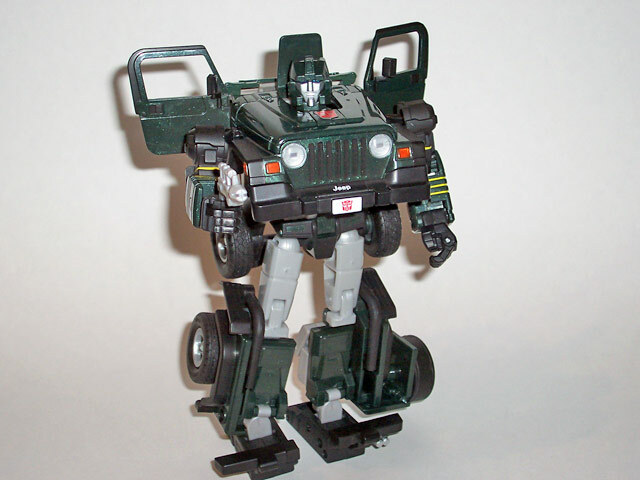 Hound can roll around quite easily on any surface, carpet etc� His rubber tires have grooved tread lines. Pressing down on the hood, as well as rear suspension can activate the suspension system. Other small action figures will have no problem jumping in this ride and going for a spin, though only good guys. Hound does not have front wheel drive like the previous alternators but that will not stop kids from having fun rolling him around. The side mirrors are made out of bendy plastic, as well as the steering wheel. The spare tire on the back can be pushed in to reveal the gun holder. Hound only comes with his gun accessory. The figure looks like and pays homage to the original Diaclone toy Transformer that we all know as Hound. The paint job is well done and shiny on the hood for a plastic figure. The Autobot symbol appears on the front license plate as well as underneath the hood. It can be hidden in vehicle mode. Hound has good points of articulation and a full range of 360-degree movements. One of my only complaints however is that the arms cannot go past a 45 degree angle when moved away from the body. A 90-degree range of movement causes the hood to pop open into his eyes. Which is not very effective in battle situations. The arm is connected to the body by a ball joint that folds back into the hood when transformed. The elbow has a normal range of movement. The hand can move in 360 motions. All the fingers move for grabbing. The index finger is separate from the other 3. The legs are connected to the hip with a ball socket, this causes the leg to sometimes become detached when transforming. The knee bends forward and backwards in the same range of motion. The feet can move back and forth. Running postures or one leg in front of the other stances can be achieved with this figure. Hound hides all his parts well. The seats and doorframes can easily be tucked away behind the figure. Hound is quite an impressive addition to any collection. Transformation: 3 - Let me just say that I only bothered to read the instructions for this review. Hound is a no brainer, but I can see how a child or young person may have difficulty. Durability: 9 - Hound is tough but he loses points for having his leg come off. I'm sure that with some clear nail polish many fans can conquer this small annoyance. AS an Alternator I experienced no paint chipping. This figure was made too last long. Fun: 9 - What makes Hound so much fun is not only his robot mode, but also the vehicle mode is great. 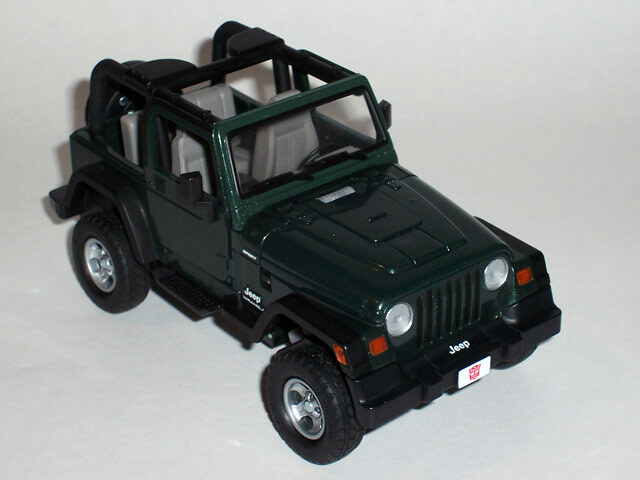 I don't know about you guys but as a kid, having a toy Jeep was always an adventure. Hound is just waiting for someone to take a ride! Price: 9 - I paid 18.98 without tax. Which totaled to about $20.45. That is a really good price if you can find him at Wally World. Summary: 10 - This is definitely a figure you do not want to miss. It seems right now that demand has exceeded supply. With the Swindle repaint coming out you will have plenty of opportunity to own this mold. So do not pass up the chance!